Board games, card games and the like are some of the easiest and least expensive ways to experience real quality time with your friends and family. Some of my most favorite memories have occurred while playing games like these with the ones I love. Lindergaff Publishing is the creator of Synonyms, a board game centered around word play. Fortunately, I had the opportunity to review this game to discover whether or not our family could add a new game to our weekly game night rotation. Keep reading to learn more! 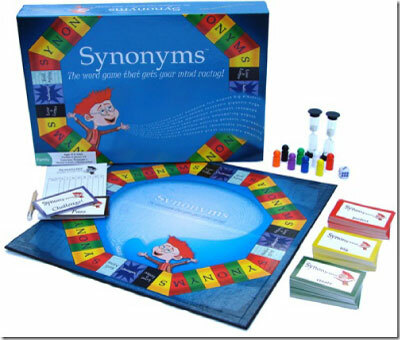 I reviewed the Synonyms Board Gamefrom Lindergaff Publishing, which retails for $29.99. Synonyms is the exciting new word challenge that entertains and educates in a fast-paced and fun board game. Players race their pawns around the board to be the first to collect all the letters of the word SYNONYMS. A roll of the die and a card is selected. The timer is set and the player has one minute to earn a letter by naming the designated number of synonyms - unless a competitor declares a challenge! Minds race at maximum brainpower as each tries to top the other by naming more synonyms. Pass and challenge cards add strategy and competition to the game equalizing the odds for all players. This game comes complete with 400 cards listing over 10,000 words, color categorized according to word difficulty. It is designed for 2-8 players and geared toward ages 10 and up. With Synonyms, the more you play, the more your vocabulary grows! Since Riley is way too young for this game, Michael and I decided to play it once she went to bed. The rules were easy enough to learn, and in just a few minutes, we were off and running! We were a little confused though, about the Challenge! rules listed here: "the challenger must name at least one additional synonym, then each goes back and forth until one can no longer top the other. (Each player/team has 60 seconds per turn)". We weren't quite sure exactly how to do the Challenge! portion, but came to a consensus between ourselves on how the challenges would be conducted and went with it. It was so much fun to see how your mind would race when you only had 60 seconds to come up with the synonyms you needed. Some of the words were simple, like stop and waste, but other words like extreme, were much more difficult. Needless to say, when I rolled a four on the die and had the word "extreme" selected, I found it virtually impossible to find four synonyms! 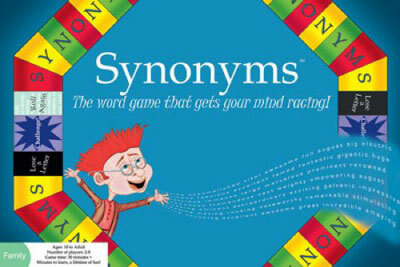 If you enjoy high-energy word games, then I would definitely recommend Synonyms. This is one game which will rack your brain and educate at the same time. It's a great addition to any family game night and can even help your children build a better, more well-rounded vocabulary! Disclosure: I received the Synonyms Board Game from Lindergaff Publishing in order to facilitate my review. No other compensation was received. This product review is based on my own personal experiences with this item and is completely honest and objective.